For the past year or so, I’ve watched my friends and media colleagues try various things to curb their social media use: some delete the mobile Facebook app from their phone, disengage from online commenting, only read the news from a physical paper, and cancel their social media accounts entirely. I, too, found myself checking social media habitually, getting ensnared in low-value conversations and scrolling more than I wanted. So, to solve this problem, I tried something much simpler: app limits, which allow users to create their own time limits on social media use and automatically alert them when they’ve reached it. 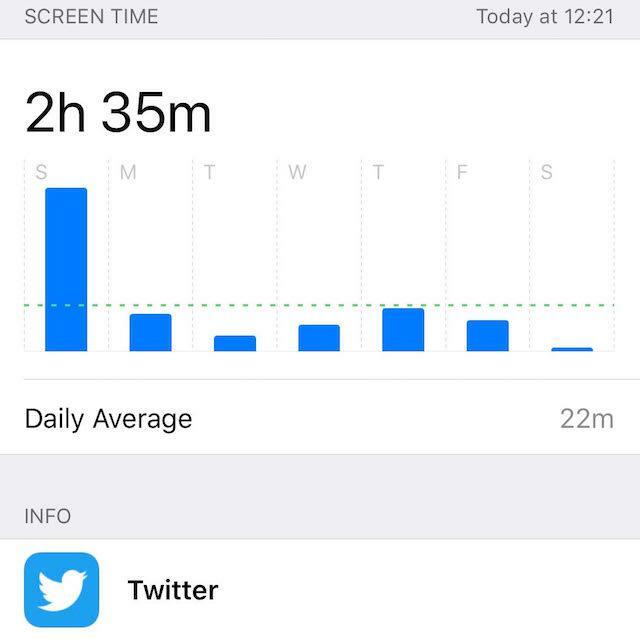 I set my social media time limit to 15 minutes a day, and, from the screenshot above, readers can see that I did meaningfully cut my time on Twitter most days after it was implemented (I only learned later that Apple does not give users access to historical app use, so I can’t provide exact numbers, but readers can see how Twitter use fell dramatically). One of the people who is most influential on social media abuse is Tristan Harris, whose wildly popular TED talk about “time well spent” eventually caught enough momentum to create a new organization, the Center for Humane Tech, which steered the conversation on how tech companies could help users limit addiction and overuse. I followed the discussion surrounding Harris and other social media critics to see how it would actually land as product or policy. Last year, a number of top tech companies began building more advanced features for self-limits. Intrigued by the Center for Humane Tech’s influence and my own need to curb my social media use, I decided to test this feature on both Apple’s iPhone X internal “screen time” setting and Android’s digital wellbeing product on the Pixel 3 (disclosure: I am a contractor for Tech4America, a think tank in Silicon Valley. I work on economic policy). These features are pretty simple: when a user is approaching or surpassing their screen time limit, the phone will alert them with a prominent notification. Now, at any time, I could have just chosen to ignore these limits. Screen time limits don’t engage a lock that can’t be dismissed. And, on occasion, I did ignore them. But, often, when I found myself getting snagged by the temptation to get into Twitter fights during the day, I would see that my screen time limit was coming up and I’d remember that I didn’t really need to respond. Instead, I would close the app and get back to things that were more valuable to me. During this experiment, I learned that there was hardly ever a time when I needed to constantly monitor social media. Even when I posted something that was popular, I rarely needed to spend more than a few minutes on the app to meaningfully engage. The marginal utility from minutes 5 to 60 on Facebook and Twitter wasn’t much more than the first 5 minutes. So, I’ve decided to keep screen time limits on my phones (yes, I’ve been using both an Android and iOS device). I’m not going to delete social media from my phones, but I do want to make sure my time is well spent.